Sonam qualified from University Dental Hospital, Cardiff in 2015. Following further examinations in 2017, Sonam was successfully awarded a Membership of the Faculty of Dental Surgery by the Royal College of Physicians and Surgeons of Glasgow. Prior to joining Bethcar Dental Practice in April 2018, Sonam worked in the Restorative, Oral Surgery, Orthodontic and Emergency Departments at the University Dental Hospital, Cardiff over a period of 2 years. She then joined the Oral and Maxillofacial Department at the Royal Gwent Hospital, Newport where she worked as a Senior House Officer. 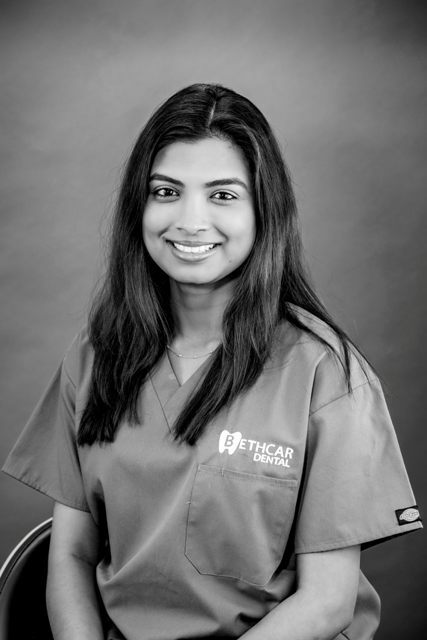 From these experiences, Sonam believes she has the skills to provide a holistic approach to treat a wide range of patients at Bethcar Dental Practice, from helping nervous patients overcome their anxiety to carrying out more complex treatment for individuals looking to enhance their smiles. Sonam enjoys all aspects of general and cosmetic dentistry, with the emphasis on preventing dental disease. She aims to make each dental visit as pleasant as possible and strives for patients to leave her surgery with a smile! Keen to pursue her interest in Cosmetic Orthodontics, Sonam attained her accreditation to provide Cosmetically Focused Adult Straight Teeth (CFAST) to adults. This rewarding treatment allows teeth to be straightened using both clear aligners and fixed braces in a short period of time so feel free to book a consultation with her to discuss this further. Outside of work, Sonam loves hiking, travelling to experience different cultures and shopping! Runner Up March 2017: Restorative and Special Care Dentistry Scientific Group Awards, Welsh Hospitals Dental Specialist Meeting. Winner July 2015: Bruce Hunter Prize In Clinical Paediatric Dentistry. Sanghavi SM and Chestnut IG. Tooth Decorations and Modifications- Current Trends and Clinical Implications. Dental Update 2016; 43: 313-318.